Yesterday Liza likened her and I to “good cop, bad cop” on this site…guess which one I am. 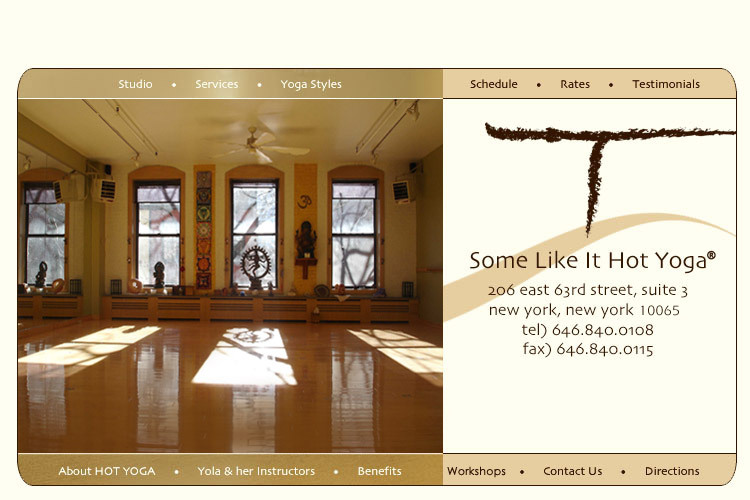 My new annoyance of the day- yoga studios that call you to remind you to come back to the studio. Like I need yoga telemarketers… YogaWorks did it today at 4:30 while I was at work. Unnecessary! Enough said. I have a weird thing for Irish music (which all started with my dad seeing Riverdance, a subsequent roadtrip through Ireland, and me, the little blond Jewish girl enrolling in Irish dance classes). Isauro played some great Irish music in class this morning (Some Like it Hot), which I majorly dug. 2 points Isauro. This post is long overdue…it should have been the first thing I ever put up on this blog. I’ve been to many, many studios in New York and have found that there aren’t a whole lot of classes that I like. Initially I was turned off by Some Like it Hot, for 2 reasons- its on the Upper East Side (I live in the West Village) and its expensive. A drop in single class is $25. But eventually I made it over there and found my little yoga utopia. First of all, there isn’t a bad teacher on the schedule- I prefer a few, but I have never taken class there that hasn’t been challenging. Secondly, they play music! And not just Krishna Das (who I love…but not all the time), but modern music. The studio is also has a sort of hippy arts and crafts vibe- there are yoga-ish murals on the walls and a shrine set up in the front of the room. There are also big windows which let in great light- something that I have always appreciated. And when you get down to it, the classes are much cheaper when you buy a series, plus they give you towels for free (many NY studios do not), and clean and store your mat. The room is hot and temperature definitely varies depending on the teacher. Generally the classes are a good flow, they usually include some type of inversion practice, and a limited amount of stretching. They aren’t super focused on form, which I guess isn’t great if you are a beginner, but for those who have a solid practice, its a nice change to not have to constantly listen to explanations of poses. There are 3 teachers that I really like, although as I said before, there isn’t a bad teacher there. Kristi Clark is a total rockstar- she teaches a hard class and has an amazing practice. She is light hearted, but knowledgeable and always puts together a great flow. Isauro Fernandez is also great- although be warned, he has his own style that takes a little getting used to. He assimilates martial arts into some of his poses and borrows certain breathing techniques, which I found to be a little harsh when I first starting taking with him. He also has the tendency to play some bad 80s/90s music, but he usually makes up for it with some really eclectic and cool world music. His classes are challenging though and I think he has a very sweet demeanor about him so his classes are definitely worth a try. Lastly Erica Gross is also great. She’s the kind of girl you would be happy to go to brunch with, but in fact, has a strong Baptiste background and is always pushing the limits with new things she has learned. Some Like It Hot’s owner Yola and her dog Romeo are often at the studio and offer a sense of community and caring that is lost at many New York studios. Yola makes it a point to introduce herself to new students and really interact with the regulars. Some Like it Hot also offers classes at many different times, another downfall for most New York studios. And for all of you who work late like me, there is a 9pm class that is both challenging and relaxing!